Dead Harvey - A resource for independent horror filmmakers and fans: Dead Harvey Interviews Kevin Wheatley and Jamie Bullock: Writer/Co-Director and Producer of, "Beach Party At The Threshold Of Hell"
Dead Harvey Interviews Kevin Wheatley and Jamie Bullock: Writer/Co-Director and Producer of, "Beach Party At The Threshold Of Hell"
"The Beach Party at the Threshold of Hell" is f'ing awesome. Plain and simple. 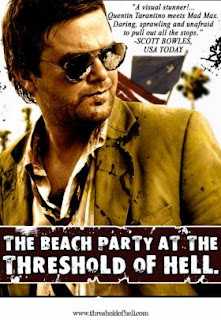 It's currently on our top ten list and deserves to be there because, among other noteworthy reasons, unlike most horror flicks who just throw five people in the woods and have them get chased by a monster, Beach Party ventures outside the box. It could be classified as horror, satire, post-apocalypic, comedy, action or cult. Take your pic and Beach Party weaves all these classic elements into a bizarre and thoroughly entertaining mesh. I see big time cult movie status in the future for this awesome flick. If you can get your hands on the comic book, I also highly recommend it. Written and illustrated by the film's co-director and writer, Kevin Wheatley, it's a pre-quel to what you see in the film and is well worth checking out. The film is like watching a comic book on acid, while maintaining a coherent story and solid script. It features Jane Seymour, Daniel Baldwin (I f'ing love that guy) and Richard Riehle as well as Kevin Wheatley and producer Jamie Bullock. Our interview here is with Wheatley and Bullock. The film's other co-director is Jonny Gillette. Our thank's for the interview and kudos to everyone involved in a movie that represents everything we here at Dead Harvey love about indie film: originality and spirit! Now, trust us on this one and head on over to Amazon.com to buy yourselves a copy. clip 20 - Film School: Yes Or No? clip 22 - What's Next?